Now that you have your blocks cut and sewn with the X on the blocks, you simply assembly sew the blocks together in your chosen design. The whole time you are sewing you just want to make sure all your seams are facing the same way. Be sure to use a 1/2 inch seam allowance to allow for snipping. The hardest part for me is deciding the layout. 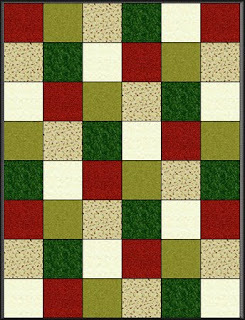 I usually turn to my Electric Quilt 6 software to quick change the layout until I find one I like. Here's the design I chose. I don't even care if the fabrics match completely in the software, I just pick fabric colors that are similar to mine. 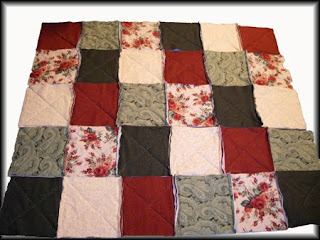 Next, I sew my assembly sewn block pairs into rows. From there, it's just joining the rows until you have your quilt. Now you are ready for your snipping of the seams. These are my favorite scissors to cut the quilts. They are a little heavy but they are built to spring open after you snip and all you do is squeeze close to snip. Let them spring open and squeeze down to snip. I find my hand doesn't get as tired. I bought them on eBay a couple years ago for a lot less. When snipping, I fold the row back on the quilt to only expose the seam, then just snip along until the row is completed. It is monotonous and I tend to take several breaks. I make my snips pretty small about 1/8" wide. 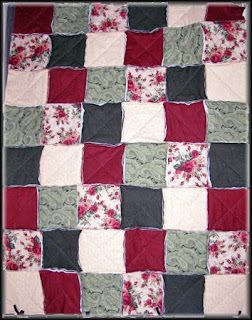 Once the rows and columns are cut, the quilt will lay alot straighter in the seams. Here's an intersection that's already been cut. After it's all completed, I try to take the quilt to the laundry mat to wash and dry. I do this because I caused my washer to overflow with all the fibers that come off in the first wash. When I give them as gifts, I make sure the recipient knows that the washing/drying will give off many fiber strands for a while. Here's the assembled quilt 51" x 68". I still need to snip the seams. 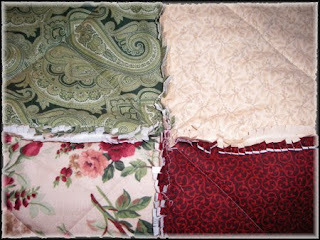 Time for me to start on the second rag quilt that is already cut. If you dedicate time to complete these, they can easily be finished in a weekend. I just loose interest too easily and need a break to do something else.